Take 77S to the Fulton Road exit (107A). Turn right at the end of the ramp. We are 100 yards from the entrance of the Pro Football Hall of Fame on the left side of the road. Take 77N to the Fulton Road exit (107A). Turn left at the end of the ramp. We are 100 yards from the entrance of the Pro Football Hall of Fame on the left side of the road. 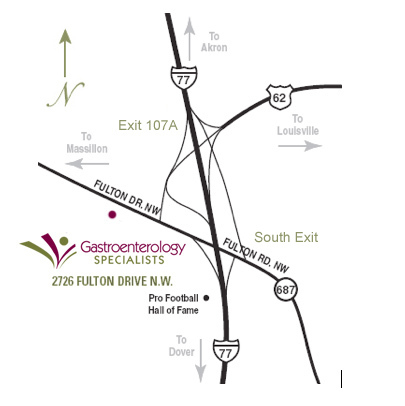 Take 62W and follow the Fulton Road exit under I-77 and then bear to the right to exit. Turn right at the end of the ramp. We are 100 yards from the entrance of the Pro Football Hall of Fame on the left side of the road. Take Route 30 E then 77N getting off at the Fulton Road exit (107A). Turn left at the end of the ramp. We are just 100 yards past the entrance of the Pro Football Hall of Fame on the left side of the road.